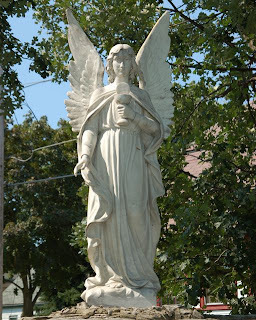 The angel to the left is at a Marian shrine near Milwaukee, WI. I took the picture on our last visit to Wisconsin. This shrine is just a small park in an urban setting, but it was a place of comfort to me during the years we lived close to it. I miss having a place like that to pray in, as I've never really found anything like it here. That doesn't mean that I've stopped praying, or that my prayers aren't still answered. Last week, I opened a piece of mail and literally burst into tears. Enclosed in a card with a beautiful image of Our Blessed Mother was a check that would meet the deductible payment that we didn't know where we'd find. It was a gift from a dear couple - completely unexpected and out of the blue. It was the answer to a prayer and will ease our family through a rough spot. I don't think I can clearly express what that meant to me & DH, but I hope they know how completely appreciative we are of their generous gift. There are angels everywhere, and sometimes they bless us in the most unexpected and wonderful ways. Thank you, sweet benefactors! We are so grateful! !